Adam Klasfeld of the Courthouse News Service has published the ridiculous piece below about our hearing Tuesday at the U.S. District Court for the Southern District of New York on our motion for a preliminary injunction, asking the court to require New York City’s Metropolitan Transportation Authority (MTA) to run our AFDI “Killing Jews is Worship that brings us closer to Allah” anti-Hamas, anti-jihad ad on MTA buses. There was nothing right in the Courthouse News Service piece. Nothing. Parody? The phrase “killing Jews is worship that draws us closer to Allah” comes straight from a Hamas music video. But Klasfeld doesn’t bother to check that (your Google search broken, Adam?). Instead, he refers to the “supposed quotation from Hamas MTV. '” Did Klasfeld not hear repeatedly during the hearing that we had to furnish proof of our ads? All of our ads. Does he think we weren’t able to do so? He never bothered to ask us. Me? I am the one trying to “tar CAIR with allegations”? 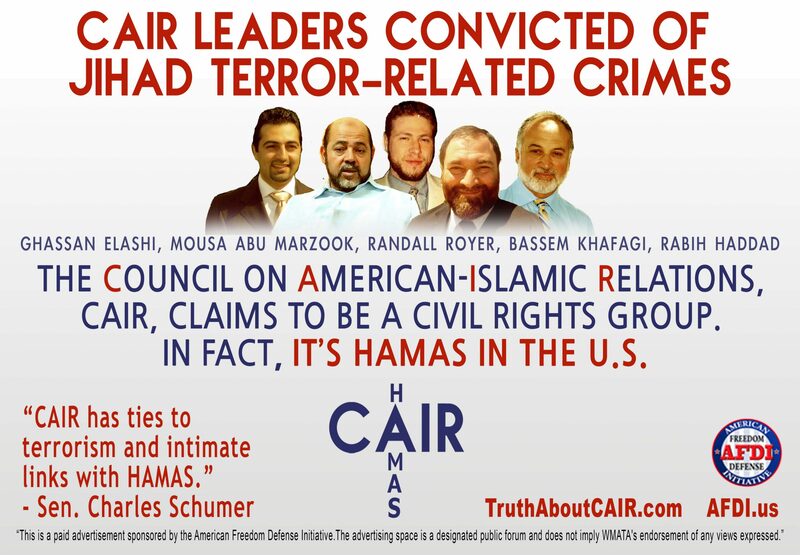 How about the US government, which named CAIR an unindicted co-conspirator in a Hamas terror funding case? How about CAIR’s top dog Nihad Awad, who has said, “I am in support of the Hamas movement”? I don’t know who this journalist is (http://www.courthousenews.com/2015/03/24/mta-questions-parody-behind-killing-jews-ad.htm), but I always consider your effort to consist of straight up legal journalism. This story is a joke. The journalist writes with such a transparent bias as to be embarrassing. The details of his article are wrong in material respects. He could not even get the name of the judge correct. A joke. He should be sent back to journalism school or just take up dentistry. Just let me know where. I’ll be certain never to open my mouth for him. By the by, I was there and he never bothered to interview me or anyone from our side. Journalism. Indeed. So Sistrom believes that Islam is a religion of peace that our ad is misrepresenting. Fine. If our ad is so outlandish and un-Islamic, why worry? All those peaceful Muslims aren’t going to react violently. So let it run! Klasfeld doesn’t even notice his own self-contradiction. He quotes the Southern Poverty Law Center when describing me as “the anti-Muslim movement’s most visible and flamboyant figurehead.” No mention is made of the SPLC’s members targeting and killing Family Research Council members, or of an SPLC member killing three Muslims in a parking dispute in North Carolina. What rational, decent journalist would use the SPLC? Why doesn’t Klarsfeld mention my books, or my being awarded the Guardian of Freedom award by the Nassau County Federation of Republican Women? Or the Queens Village Republican Club, the oldest Republican club in America, honoring me as the “American Patriot of the Year” in February 2013? That same month, the Creative Zionist Coalition gave me the Queen Esther Award for Jewish Heroism. I also received the Annie Taylor Award for Courage in 2010 from the David Horowitz Freedom Center. In October 2011, the United States Marine Corps presented me with the flag flown on September 11, 2011 over Camp Leatherneck, “amid the battlefields of Afghanistan during decisive operations against enemy forces in Helmand Province.” Why is the radical hate group SPLC only mentioned, and Klasfeld finds none of the above fit to print? And why is my esteemed lawyer smeared as well? It’s as if these yellow journalists copy and paste the Hamas-CAIR pressers word for word. MANHATTAN (CN) – New Yorkers might not get the parody behind bus and subway ads blaring the words “Killing Jews is worship that draws us closer to Allah,” two Metropolitan Transit Authority officials said in a day-long federal court hearing. Two Metropolitan Transportation Authority officials took the stand here on Tuesday to defend their decision to reject the message as “incitement” and “fighting words” that could inspire the very violence it purportedly condemns. “In my mind, that’s advocating killing people, and that’s not what we should do,” MTA’s security director Raymond Diaz told the court. The AFDI has been trying to bring their “Killing Jews” ad to New York City subways after running the campaign in Chicago and San Francisco. The group and its leader Pamela Geller – a blogger whom the Southern Poverty Law Center calls “the anti-Muslim movement’s most visible and flamboyant figurehead” – call the ad a parody of the “MyJihad” campaign by the Council on American Islamic Relations (CAIR). CAIR, a Muslim civil rights group, launched its “MyJihad” campaign in an effort to reclaim a tenet of the Muslim faith from violent extremists and those who equate it exclusively with terrorism. The AFDI’s ads attempts to tar CAIR with allegations, which it has long denied, that its executives support Hamas. But New Yorkers viewing the parody likely will not get the reference because CAIR’s ads never ran here. The advertisement also runs the risk of driving Jews to seek “retaliation,” he told the court. AFDI’s lawyer David Yerushalmi, who wrote draft legislation that inspired a Tennessee bill seeking to criminalize the Islamic religious code known as Sharia law, insisted that any risk of violence from this ad was overblown. The “Killing Jews” ad campaigns ran in Chicago and San Francisco without any violence, he noted. MTA’s lawyer Peter Sistrom noted that New York is a bigger terrorism target than those cities, and has a larger Jewish population. AFDI has fought for, and often won, the right to run offensive ads like these across the country. Three years ago, the group was in another room of the same Manhattan courthouse seeking the approval of an ad describing Islamic militants as “savages,” which a different judge found they had the First Amendment right to run. Courts in Seattle, Philadelphia and Detroit also have reached the same conclusion in different cases, even as the AFDI’s campaigns have drawn criticism from anti-discrimination groups. MTA’s director of real estate Jeffrey Rosen, who also testified in the last New York case, said that the AFDI’s latest campaign is in a class by itself. Unlike those other ads, the problem with the “Killing Jews” campaign is not just that it’s “controversial and hateful,” lawyer Sistrom added. “We read the ad as a demand that Muslims attack Jews as an act of religious obligation,” he said. U.S. District Judge Thomas Keenen, who is hearing the AFDI’s latest case, has not indicated how he would rule, but he seemed skeptical of MTA’s claims that the ads put New Yorkers at risk. If he issues a preliminary injunction, AFDI will be able to proceed with their campaign. Attorney Sistrom urged the judge to give his team time to contest the decision, if he decides to rule against MTA. “If you force us to put up the ad now, that can’t be undone with an appeal,” he said. Yerushalmi countered that the standard is the opposite under First Amendment law. “It is irreparable injury every minute my client’s speech is being constrained,” he said. Proceedings lasted nearly five hours before concluding without a ruling.